This has been my new favorite dish. It's such a simple and easy dish yet comforting. I miss eating Hainan Chicken rice so this is my version of chicken rice. Hainan Chicken rice is made with steamed chicken that usually had some ginger rubbed onto it and it goes along side with rice that's made with chicken broth. You also have some soy sauce and chili paste that you mix in the rice to give more flavour. There are a couple of restaurants in the bay area who had Chicken rice on thier menu. I've tried it and it's not just the same. Maybe i'm being picky but hey, when you've had the real thing, you have high expectations. 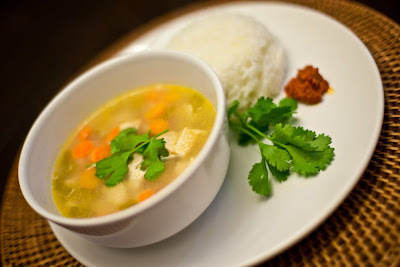 Again, the recipe for this soup is one my mom used . I've added a few thing to it to give it my own touch. Instead of soy sauce and the chili paste, i eat my rice with Sambal Belachan which is a chili paste with dried shrimp. It's mainly used in malaysian food. I get mine sent from Singapore!! It's definitely on top food list. I've made it at least once every week! Here's the recipe. In a large pot, saute onions, red pepper and minced ginger & garlic for 2 mins. Add in the carrot and celery with 6 cups of water. Add the cubed chicken and let it boil. The Chicken cubes will cook within 5 mins so i remove them from the pot and let the carrots and celery cook till they are a little soft. Yo may cut the cooked chicken into smaller peices if you'd like . When carrots and celery are cooked, add the chicken back into the pot. Add some lemon juice, salt and pepper and give it a quick boil. Serve with some Ginger rice.